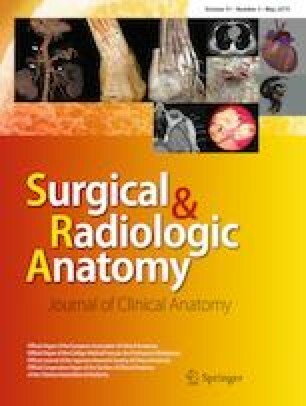 The main objective of the study was to investigate the morphometric properties of the stapedial tendon (ST) for pediatric otosurgeons and anatomists. The present study was placed on 15 fetuses (8 females, 7 males) aged from 20 to 30 weeks of gestation (at mean, 24.27 ± 3.24 weeks) using the collection of the Anatomy Department of Medicine Faculty, Mersin University. All measurements were obtained with a digital image analysis software. In terms of male/female or right/left comparisons, no statistically significant difference was found in relation with the numerical data of ST. The surface area, length, and width of ST were detected as follows: 0.61 ± 0.15 mm2, 1.27 ± 0.30 mm, and 0.45 ± 0.08 mm, respectively. The absence of ST was observed in two fetuses with and without severe malformations. In another fetus with cleft lip and polydactyly, multiple abnormalities were bilaterally identified in the middle ear: (1) the absence of the incudostapedial joint and (2) the presence of an abnormal tissue attaching to the stapes. The abnormal tissue was determined to be irregular dense connective tissue using light microscope and electron microscope. Our findings showed that ST did not proportionally grow according to increasing gestational weeks. In the light of the numerical data, we thought that similar to stapes, ST attains the adult size in the fetal period. As ST anomalies may accompany severe malformations (e.g., cleft lip, polydactyly or syndactyly) that can be easily detected on observation by clinicians, we suggest that the detailed examination of middle ear in newborns should be taken into account for early diagnosis of conductive hearing loss to prevent any management delays. Deniz Ladin Özdemir, Fatma Müdüroğlu, Diana Georgiana Cintacioiu and Hong Thai Le participated to this study as visiting students. OB, TK, MİK, ŞNY, YV, DÜT, ZKO: Project development, Data collection, Data analysis, Manuscript writing, Manuscript editing. DLÖ, FM, DGC, HTL: Project development, Data collection, Manuscript writing.